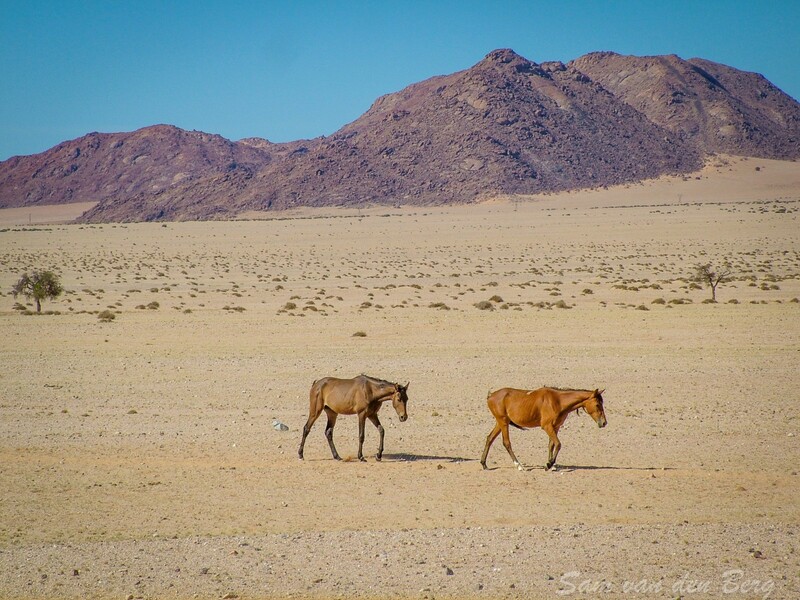 These horses have adapted to life in the arid Namib desert environment and are frequenting the Garub area where there is a waterhole as well as a hide from where visitors can view these remarkable animals. Whilst travelling between Aus and Luderitz make some time to visit the hide and please adhere to the following rules. Take special care on the tar road and avoid driving at night as the horses might stray onto the road. Keep your distance for your own protection, too. The horses are not aggressive, but serious injury can be sustained through their movements or kicks while interacting with each other. There are numerous theories regarding the origin of the wild horses. The only agreement is that they are not indigenous. Horses were imported into Southern Africa by Europeans. The wild horses are therefore descended from domesticated horses and were for one or other reason forced to adopt a feral way of life. But how come did domesticated horses stray into this area? And how did it happen that they turned feral? Some theories point to a ship with a cargo of horses and other domestic animals which was wrecked about 25 km south of the Orange River mouth, roughly 200 km from Garub, in the late 19th century. Duwiseb Castle - Hansheinrich von Wolf? Others refer to the stud farm at Duwisib owned by Hansheinrich von Wolf - about 250 km north-east of Garub. However, a farm manager was in charge when von Wolf was absent during the First World War and after he was killed in action. And according to the farm’s bookkeeping no horses were lost until the late thirties, whereas reports about Wild Horses near Garub already started to circulate in the twenties. Furthermore, neither of these theories takes into account that horses do not migrate over large distances but usually stay in the area they know. 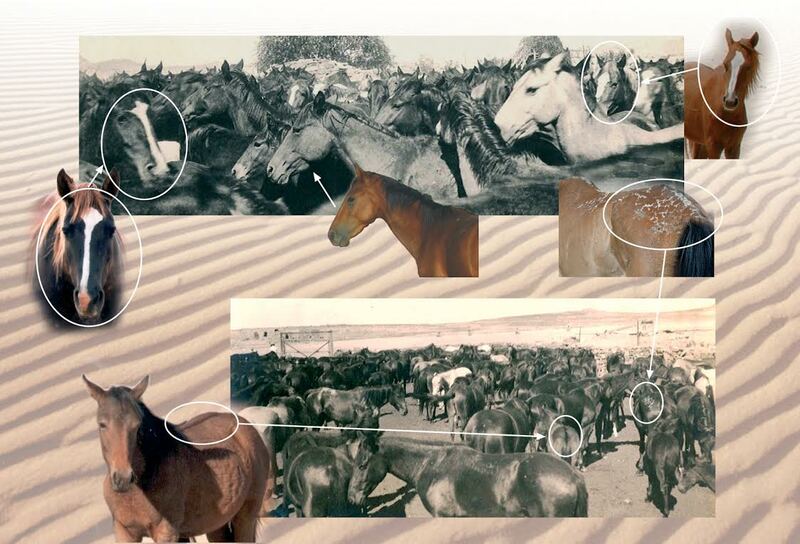 Thus it can be concluded that the Wild Horses are descendants of horses lost in the vicinity of Garub and Aus. Another explanation is that the Wild Horses are remnants of the First World War. During March 1915 the German colonial and South African Allied forces gathered in the Aus / Garub Area. The Germans were based at Aus where they kept around 2000 horses. They also had two planes with which the Allied Camp were bombed sporadically. The Allied forces that pitched camp at Garub in March 1915 consisted of about 10,000 South African soldiers with 6,000 horses. Just imagine a concentration of around 8,000 horses in the Aus / Garub Area! Can this explain the existence of the Wild Horses? It is said that the German retreat largely proceeded in an orderly fashion so it is unlikely that many horses were left behind. 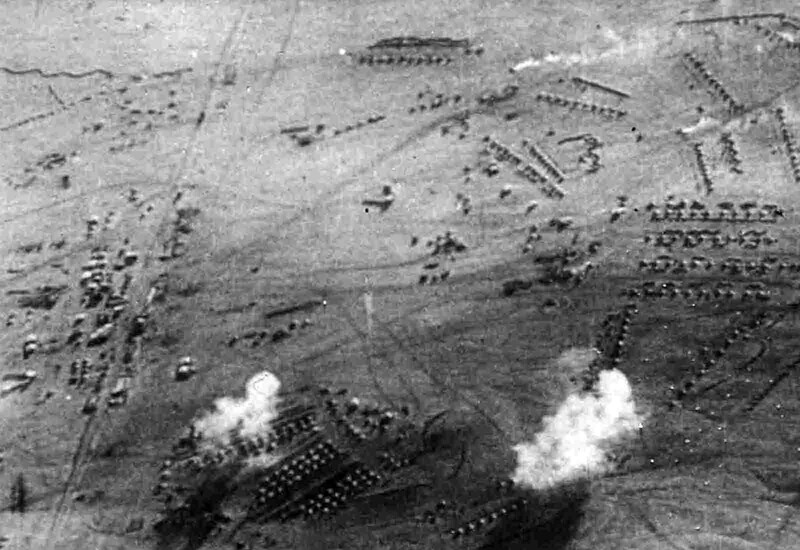 A report, compiled later about the events of war at Aus, states: "In the morning of 27 March the indefatigable pilot officer Fiedler flew to Garub and caused great bewilderment by successfully dropping bombs onto the enemy camp and amongst about 1 700 grazing cavalry horses." (Hans von Oelhafen: Der Feldzug in Südwest 1914/15, Berlin 1923, page 117). The South African forces were about to start their offensive and had orders to follow hot on the heels of the retreating German soldiers. Most likely there was no time to catch all of the bewildered horses although some Allied soldiers would have been left behind after the main force left. There was a borehole for replenishing locomotives on the nearby railway line at Garub and although it was blown up by the retreating German forces, it was repaired quickly enough. Namibian amateur historian Walter Rusch came across another piece of the puzzle which completes the picture. In photo albums which belonged to Emil Kreplin, the mayor of Lüderitz from 1909 to 1914, he found pictures of a horse stud farm at Kubub, south of Aus where Kreplin bred workhorses for mining – and racehorses for the flourishing Lüderitzbucht after diamonds were found in 1908. It is probably thanks to the diamond finds at the coast that the horses were not caught again. As early as 1908 the German colonial administration established restricted areas which extended about 100 km inland and were strictly controlled. The surroundings of Garub were part of Sperrgebiet II. Nobody was allowed access, with no exception made for hunters or horsecatchers either. Garub with its borehole and the drinking trough, which was set up later, became the pivotal point in the horses’ existence. 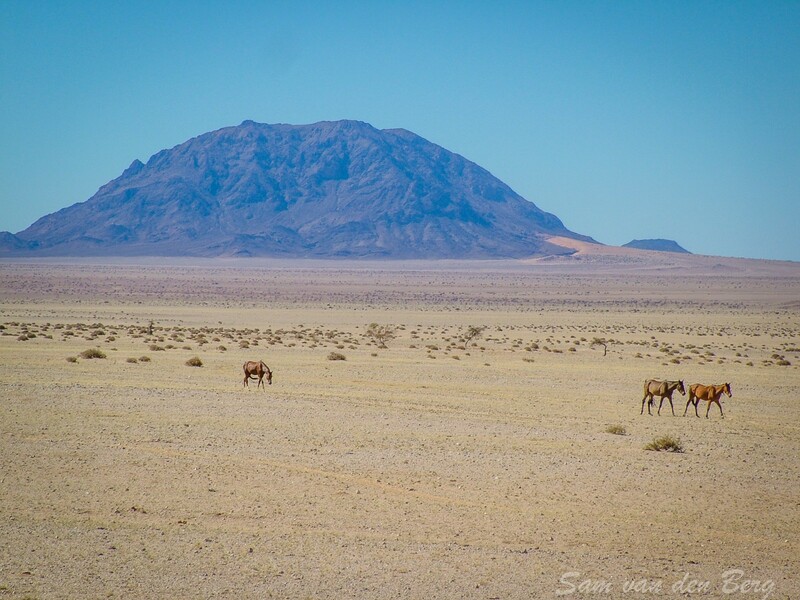 The Namib Wild Horses - A breed in it's own right. The population of the wild horses fluctuated between 50 and 280 in the 100 years of their existence. (Namibia Wild Horses Foundation) These fluctuations are influenced by drought and predators such as spotted hyenas, leopards and black backed jackals. Especially young foals and juveniles, provide a major food source in the southern Namib Desert for the spotted hyena. Over the years the horses have adjusted their behavior (patterns of feeding and drinking, resting and playing according to the amount of grazing influencing distances to travel, and prevailing temperatures) in order to adapt to their feral existence. The wild horses even though "wild" can, during extended periods of drought not survive totally on their own. It is essential to keep the population viable to maintain a positive gene pool and to prevent inbreeding. 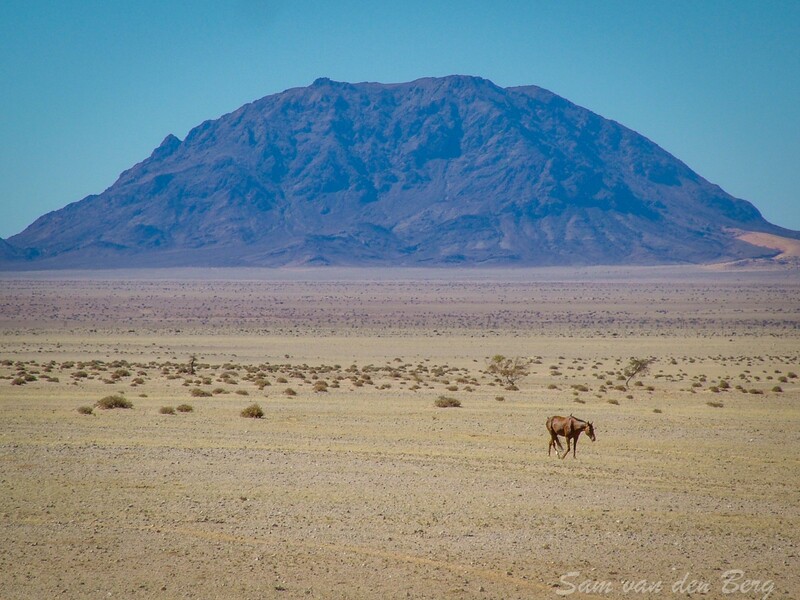 Limited intervention measures were put in place to ensure the future of the Namib's Wild Horses. 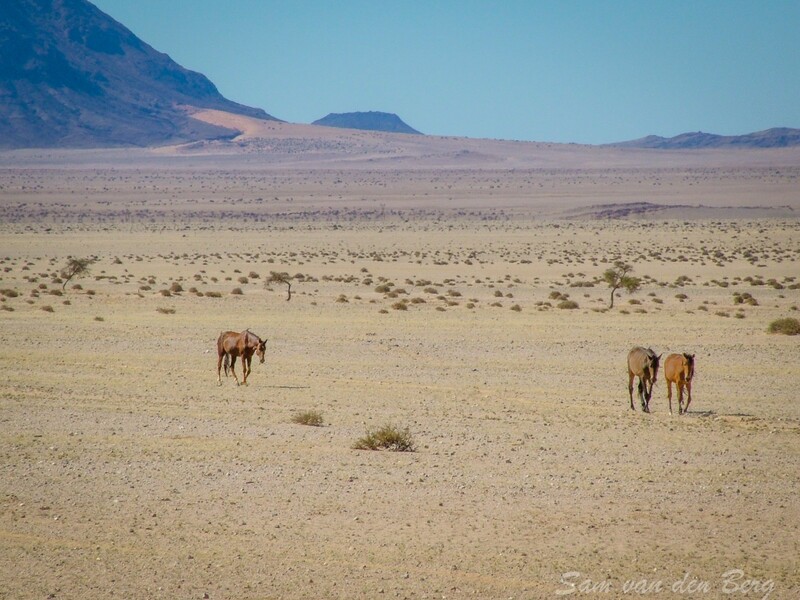 More information on these animals and how you can assist to ensure their survival is available on the website of the Namibia Wild Horses Foundation.